UK strips Islamonazi ISIS bride of her citizenship, her family sues in court……. – The Tundra Tabloids……. 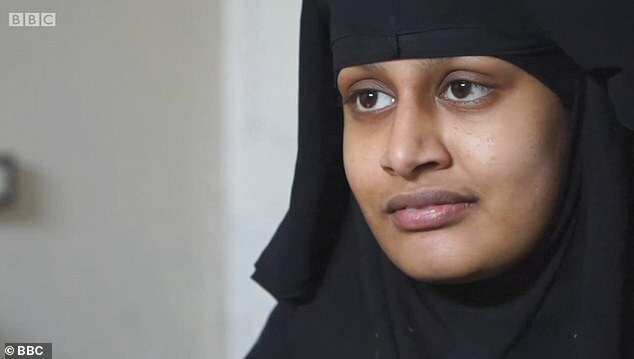 The family of ISIS bride Shamima Begum today vowed to take Home Secretary Sajid Javid to court to stop him taking away her British citizenship. The remorseless 19-year-old is in a Syrian refugee camp with her newborn son but Mr Javid has moved to ensure she will never allowed back into Britain after she fled to join Islamic State. The Home Office will argue that because Begum’s mother was born in Bangladesh he daughter is entitled to dual citizenship meaning she would not be left stateless, which is illegal under international law. But Begum’s family says she does not have a Bangladeshi passport and has never been there, making Mr Javid’s decision illegal, they claim. The teenager, who fled Britain with friends aged 15 and married a Dutch jihadi, has been unapologetic about ISIS’ crimes and said the Manchester Arena suicide bombing could be considered ‘retaliation’. She also insists that the British public should be ‘sympathetic’ towards her and should be allowed back to London with her baby on human rights grounds. But last night Sajid Javid last night moved to block her return to Britain arguing that taking away her British citizenship is ‘conducive to the public good’ on terrorism grounds. Previous Post Previous Post US: Jihadi bride has buyers’ remorse, wants back in after Islamic State dream collapses……. Next Post Next Post Shimon Samuels: France Moblizes Against Antisemitism……?